Dutch angler Goris started his fishing holiday in Thailand with a trip to the Maeklong River, Samut Songkran in search of Giant freshwater stingrays. On arrival Goris was soon fishing a wide section of the tidal river with baits positioned at various points spanning its width. The morning passed quickly with no takes forthcoming but on retrieval several baits had been crushed. A move to another section of the river further downstream saw baits once again deployed at various intervals in the hope of locating the elusive stingrays. Several hours passed before the river began to level off and a bite was forthcoming. A slow determined take saw the angler soon bent into the first stingray of the trip which was soon clamped onto the riverbed. Continued pressure applied directly from above soon saw the stingray on the move again and a short fifteen minute battle ensued. The Giant freshwater stingray was quickly brought to the riverside where it was estimated to weigh 60-70 kg. 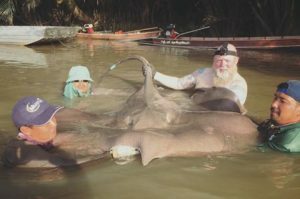 The freshwater stingray was photographed and allowed a short period for recovery before being released back into the Maeklong River.